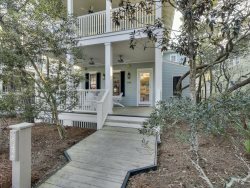 Exceptional quality, style, and elegance describes this fabulous vacation home located in beautiful Seagrove Beach, this home is just the place to spend your next stay on 30A. Upon walking into the open concept floor plan along with new coastal decor and furnishings, you will be truly pleased. The spacious living room has comfortable and cozy furniture and is the perfect place to relax after a long day at the beach. Watch the game on the large flat screen TV. The fully equipped kitchen has all stainless steel Samsung appliances, granite countertops, and plenty of storage space. Also on the first floor is a King Sized Guest Bedroom and a shared bathroom. As you walk up to the second floor there are two more guest bedrooms that offer King beds. A one of a kind bunk room that sleeps 8 comfortably and provides a large flat screen TV. Also included on the second floor is the laundry room. Make your way up to the third floor and you will be amazed at the views! The Master King bedroom offers a private en suite bathroom and its own private balcony. There is a small kitchenette on this floor, that enables you to keep your favorite snacks handy as you escape in the gorgeous views.